In the year 2000, a team of specialists in Film and Photography, headed by myself, decided to tell the story of the earliest film makers - by recreating replicas of the very first motion picture cameras. This project of over 15 years duration is now complete and we would like to introduce you to “The Race to Cinema” collection, covering the years from 1886 to 1895, when the first commercially successful movie camera became available. This is cinema archaeology! The 15th and final camera however is not a replica but an original Lumière Cinematographe, this camera was designed and owned by that great pioneer of cinema Louis Lumiere and then given to his daughter Yvonne. She passed it on to Henri Lumiere and it was obtained from him by a private Lumiere museum at Uzes in the south of France. When this museum collection was dispersed early in the 21st century, the camera was acquired by me for the “Race to Cinema” collection. 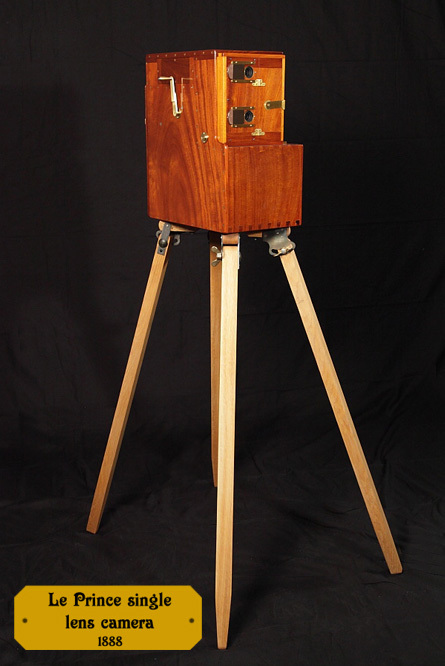 Edison’s peepshow kinetoscope gave a shortlived glimpse at the possibilities of this new medium. Then the first public film screenings took place in the USA and in Germany, but with limited success. Commercially, “The Race to Cinema” was won by Auguste and Louis Lumière with their famous Paris filmshow in December 1895. Since then, from its humble beginnings, the motion picture has developed worldwide into a film and television industry worth a trillion dollars a year. This is the international story of the first moving image cameras, and the men whose inventiveness made all this possible.